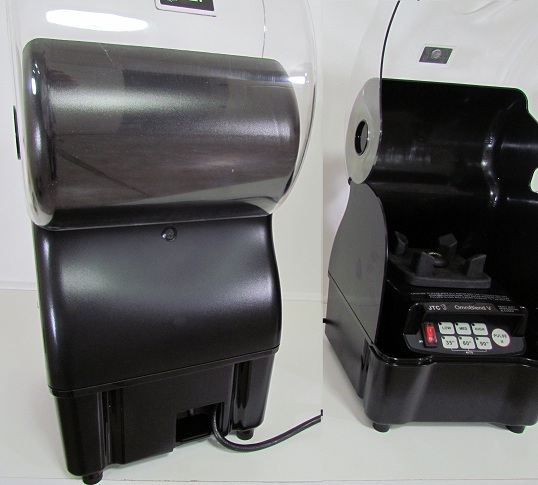 I PURCHASED MY OMNIBLEND V. AS AN EARLY BIRD BUYER AND RECEIVED IT IN JULY. IT HAS BEEN PERFORMING BEAUTIFULLY. I AM NOT USING IT FOR A RAW FOOD APPLICATION, SO AM NOT GRINDING PITS, ETC. I DID MAKE SMOOTHIES/SORBET AND IT HANDLED THE ICE NICELY, SO THAT EVERYTHING WAS SMOOOOOTH. I LOVE THAT IT CLEANS ITSELF; PRETTY NIFTY! I USE THE 50+ OUNCE CONTAINER THAT CAME WITH THE BLENDER. FOR A SINGLE PERSON, IT IS STILL LARGE. I HAVE A FRIEND WHO WANTS TO GIVE ME A 32 OUNCE CONTAINER FROM THE VITAMIX 5200, WITH WRENCH AND NUT. I BELIEVE THAT IT SHOULD WORK. I THOUGHT THAT THE OMNI CAME WITH A 6 BLADE CUTTER, BUT MINE LOOKS MORE LIKE A 4; I MAY HAVE BEEN CONFUSED AS THERE WERE SEVERAL OPTIONS. DO YOU HAVE A 6 BLADE AND WILL IT FIT ON THE 32 WET TRITAN? IS THE BLADE DIFFICULT TO PUT ON? THE FRIEND HAS TWO VITAMIX 5200 BENDERS....NO, NOT MILLIONAIRES, BUT A BLENDED FAMILY. I BELIEVE THE OMNIBLEND V IS SOMEWHAT QUIETER THAN THE VITAMIX AND I THINK ANYONE LOOKING FOR ONE OF THESE SUPER PROFESSIONAL BLENDERS SHOULD PURCHASE THE OMNIBLEND. YOU CAN GET A VITAMIX COOKBOOK ON EBAY, OR USE THEIR SITE, AS YOU RECOMMEND....LOOKING FORWARD TO SOUPS WHEN THE WEATHER COOLS. I cannot remember how i paid for the last one for myself... if it is paypal? I meant to let you know long ago how happy I am and you were right , i don't need the noise enclosure box... besides i dont have room for it on the counter!! p.s. do you gift wrap? I've been using my Omni V blender for a week or so now and I just love it. It is so powerful, it just vaporizes avocado pits and everything else I put in it like they were nothing at all. Blackberry seeds are a little tough for it but otherwise it can handle anything I've tried so far. I'm so glad I found your site, and thank you for helping me decide when I talked to you on the phone. that). Its working perfect, just as new. Thanks again for your great service.. I just wanted to say thanks you so much for my blender. I really love the thing and am grateful to be able to get one at a price I could afford. Thanks again and I'm sure I'll bet getting more stuff when the need arises. I started looking at the blade after I emailed you because I was thinking how would they have attached the blades to the bearing and then saw that there was the top bolt that holds the blades. I took it apart and under the bottom facing blade was some black sticky stuff. I don’t know if it was food or soap but it came off with denatured alcohol and steel wool. The bearing turned after getting the blades off. I sharpened them and put them back in. The bearing looks like a sealed unit and not sure it could ever be fixed but blades sticking to the bearing, I can fix. I do use clear water and a couple drops of soap to clean the blades and maybe I haven’t been giving it the full 10 seconds. Anyway now after blending a little soap I rinse add clear water and blend rinse water. So, I’ll see how that works after a while, it’s not much trouble anyway, not like washing pots and dishes required when you make a meal so I don’t mind. I gave up on the green salad smoothies, still hated them, and just do fruit now. I’ve lost about 10 pounds and am doing well with it. My wife works with a lady who takes protein shakes to work and Kay asked her what it was. She uses the drugstore CVSs vanilla protein shake, cost $17 for a big container and tastes pretty good. I mix a few fresh or frozen berries or fruit, some milk, some ice and use 1 scoop of the powder. Keeps me satisfied all morning. Last time I was at GNC I asked the lady what protein shakes she used and she showed me this huge container of whey/protein they have, it’s actually cheaper than CVS if you get the Buy 1, get 1 Half Off offer they have. It is really delicious, I actually look forward to having it for breakfast. I got some today that is chocolate. Yum. Doing good, love my blender. I’ll send you a check. Jerry, thanks for sharing that info. What exactly did you do (soak)? The blades can be fixed at times... I have been using one blade that I received back as a warranty exchange now for over 4 months and it works fine. Maybe that is the case with your blade. What do you think? Anyway, I don't have paypal anymore. You had to fix the blade. so is this really a situation where I should charge you something for the blade. I want to be fair with you. How about we split the cost? The blade sells normally for $ 45. What if you sent me a check for $ 20.00? That would be fine, but I leave it up to you. I got the new blade. I did soak the old one and took it apart and got it working. I would like to keep the new one so I can have a sharpened spare. Let me know how much and I’ll PayPal you. Hi Jerry, thanks for your email. I am glad everything is well and that you like the blender. As you discovered, I too think the blade bearings just froze up. I may be able to fix it. I will send you a new blade out today. Would you please send me the broken blade back? Haven’t talked to for a while. Did you get your lawsuit done? Hope things are good. Love my Omni and use it 1 or 2 times a day. I did have a problem this morning with it. When I started it the motor didn’t really turn. I stopped and tried again. It just wouldn’t go. I took off the jar and with my hand tried to turn the blade, it is really hard to turn. I don’t see any way to take it apart. I did take it out of the jar and looked it over. Just seems to be bound up inside. How do I get a replacement? I am writing to tell you that I am very happy with my Omni blender. I've done lots of smoothies, made soup, blueberry stevia ice cream, blended batter for dehydrated flax crackers - in the last couple of days since it arrived, and it has done a wonderful job on everything. I can really appreciate its power and efficiency. I started making green smoothies a couple of weeks ago and I wanted to try them a while before investing in a high-speed blender. I had to chop/blend the items in my food processor and then put them in my fairly new, but woefully inadequate KitchenAid blender to even get the bananas to blend. So it was an exceptional pleasure to be able to do all that much more efficiently in the Omni - not to mention how much better the green smoothie tasted! I am also amazed at the amount of greens, vegetables and fruits that we have added to our diet. I had my husband read through your site and he was the one who decided that we should get the 3 hp Omni and we are both glad that we did. Thank you for taking the time to share your knowledge of the different units. We found it very helpful. I told one of my friends about my new Omni and all the things I made in it. She wanted me to send her your site and she is probably going to order one too. We recieved the Omni just when you said we would. I thought I would like the controls and sure enough, I do, easy to use and seem to do the job well. At first I thought it wasn't turning very fast because it is much quieter than our original blender but it pulverizes fruits and veggies in 1/10 the time. When blending/working hard it makes a funny smell like warm electronics. Probably residual grease or oil from manufacturing burning away, it seems to be getting less so I hope its nothing. Anyway, I'll be checking out your site from time to time or using you for accessories and parts, so stay in business, eh?? Thanks again for your help, I am enjoying smoother smoothies!!! Hi Michael, thanks for your email. I am glad you like the blender. I already sent the Vitamix container your way. Hello Blender guys, Just wanted to let you know I got my omni blender last Wed.and I am loving it.This machine has good power to do what I need it to do.The only thing I haven,t been able to completely blend are strawberry seeds and kiwi seeds,no big deal.I am very satisfied.I was wondering if you had received the vita mix containers yet and if it has been shipped.I appreciate you very much and enjoyed doing business with you.I will try to send some future customers your way. 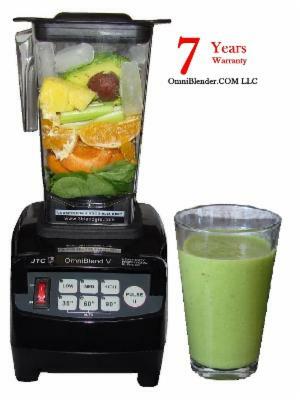 I purchased the Omniblend V. 3HP blender, three months ago. I use the blender several times a day, due to a blended food diet. I was a bartender, for twenty-five years (part time), in a high end supper club. I used all the top end blenders and from my experience, I feel that Omniblend V can run with the big dogs. Saving $150.00 or more…is sweet…more bang for your buck. Every aspect stated in the online ad, about the Omniblend V, is valid. . The proprietor was knowledgeable and congenial in answering my questions. The delivery of the blender was prompt. I am confidant the proprietor will be honorable, if the situation arises. All in all… I am a very satisfied Omniblend V owner. Disclaimer: Note that we have removed where possible any blender brand name from a company that has notified us that they wish not be named in this website. If you read that brand name (trademarked) high performance blender trade name in the CUSTOMER LOBBY driven Review Page and windows, it is because we have no control over what customers are writing. Please also understand that we are not responsible for anything stated, promised, suggested or otherwise implied or not, whatsoever customers and reviewers may post in the CUSTOMER LOBBY driven Review Location! Blender not included. Dimensions are 10 x 12 x 18.25 " weight 7 lbs.